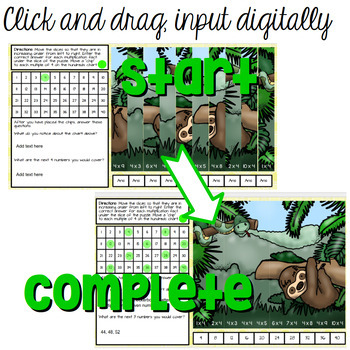 Explore and review multiplication facts digitally! This resource is for use with Google Drive™. 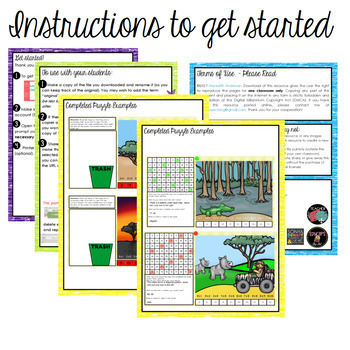 With this resource, your students will work with multiplication facts from 2s to 10s. Each puzzle has 10 slices, and is similar to a paper or craft stick puzzle that you may have used with your students. Through testing of this resource, it is apparent that it's much easier to complete with the use of a keyboard and mouse (or at a bare minimum, a mouse). Please take this into consideration before making your purchase. • Instructions on using the resource, with examples (11 pages): Also includes instructions for using with Microsoft OneDrive. 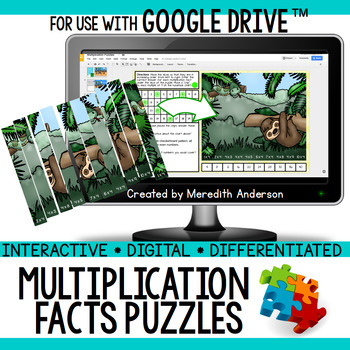 • Digital Multiplication Puzzles (18 pages): 2 variations for EACH set of facts (2s to 10s). 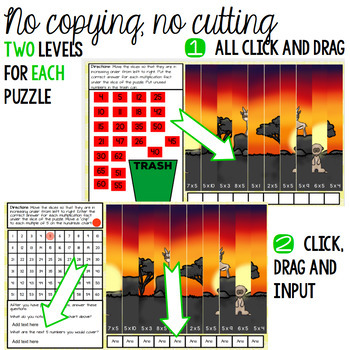 One of the puzzles only needs click-and-drag actions, the other needs information entered (both numbers and reasoning). Why should I use a digital interactive resource instead of a paper one? • You will save paper and ink, increase technology fluency, and support a green environment. • Digital files can be accessed anywhere you have an internet connection! No need to worry about losing papers or keeping track of handwritten notes. • Your students will be engaged, and you won't have scraps of paper all over your classroom! You also won't have to search for pieces that might go missing. • Once the project is complete, your students will have created a piece of their digital portfolio. Since the information is housed on slides, presenting their material is much more seamless and manageable. Are there any other benefits to using a digital interactive resource? • Digital resources can be high in color and image-heavy, without worrying about using excessive ink. • Students can gain many tech skills they may not get otherwise, including learning short cut keys, manipulating digital elements, and many more. • Peer collaboration, editing, and review are all available at the click of a button. • Editing and updating are not cause for a total redo! • When you are to start the activity over again with a new group of students, you won't need to run to the copy machine. What if I can't get something to work as I think it should? • As with any technology-centered resource, there may be some hiccups along the way. I have provided very detailed instructions for using this resource. If you get stuck, please feel free to contact me and I will do my best to work with you so that you and your students can reap the benefits of going interactive and digital.